ZERO PIXEL comes from the desire of 3 duos of artists / Mariane Moula et Carole Thibaud / Clinch et Pierre Pierre Pierre / Antoine Ledroit et Aurélie Percevault / to play together an intense composition of sound and light. After early improvisations, we are working on different and adjustable sets. Those sets are composed with a fondness for mechanics and sober system, desire of sensory immersion and playing with persistence of vision. We wish to find a form between installation and performance, turn the virtuoso artist-performer into the operator-technician paying attention to the mechanics, to convoke technical code of the cinema (countdown, film leader), to mix sound and image. We also wish to play in particular places and adapt our sets to different contexts. 18ips is our first mutual effort. Sound and visual elements are slowly evolving, in a flickering pace, into a more tangible and chaotic ensemble. Beginning as a simple mono-screening where countdowns of film leaders are following and stacking themselves, 18ips is becoming more and more complex and expanded in order to offer an experience of frenetic immersion. 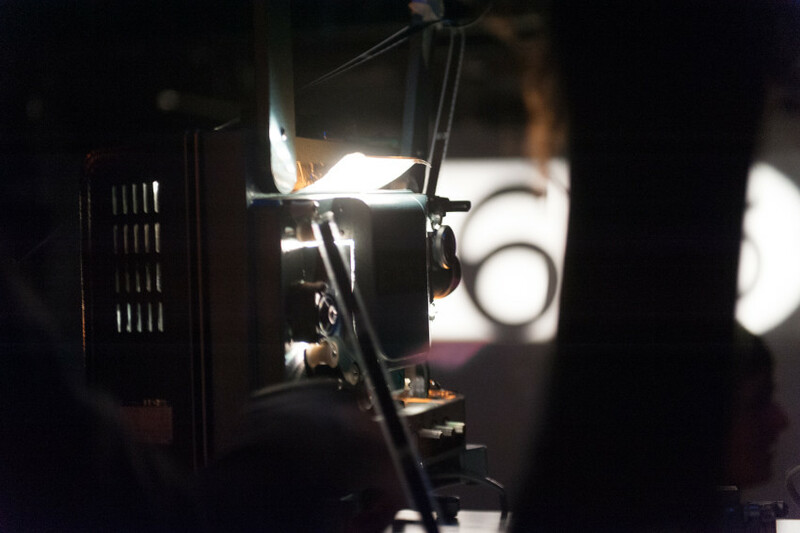 A single reel, going simultaneously through 6 projectors, is manipulated by the 4 operators who are trying, in a delicate way, to avoid the film split. 18 ips is a distant and modest echo to the interlocking projectors (technique used in multiplex theaters to trend simultaneously a single length of film through multiple projectors). Sounds are produced by the (mis)use of two audio recording tools. A mixing board where each of the 6 tracks are patched in feedback via a photoresistor, triggering a brief feedback noise each time it is hitted by the light beam. Like an echoe of the visual flicker, hight to extremely hight frequencies impulse collides and melt as the rythm go faster and faster. Meanwhile, two 4track tape recorder are stacking various hiss and crakles, thickening soundspace. This reveals a tension between mechanichs and its fate (the ineluctable countdown) and the unstable nature of the film, the possibility of the accident. The system shows finally the imperfections of the machine and the operators.